Thanksgiving is a week away, can you believe it? It’s my favorite holiday, a day set aside for thankfulness and food and I think I’ve really gotten into the Thanksgiving spirit this year. 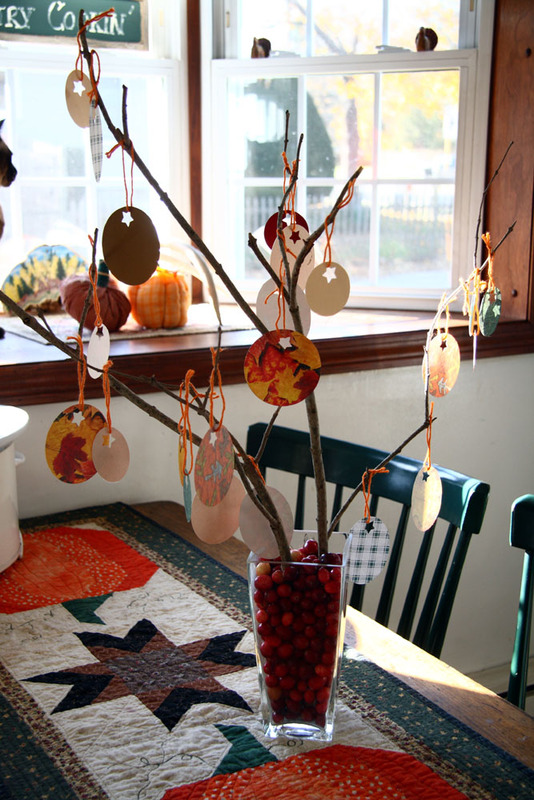 Our house is decorated with fall leaves and gourds, turkeys and a Thankful Tree. You know what a Thankful Tree is, right? It’s just what it sounds like – a tree loaded with things for which you are thankful. I made mine last Sunday and it didn’t take much time at all. 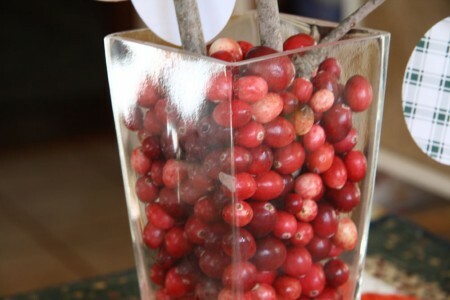 I had Dale bring me a branch from the yard and I stuck it in a vase of cranberries. I used my scrapbooking supplies to cut out circles and ovals from fall themed paper. 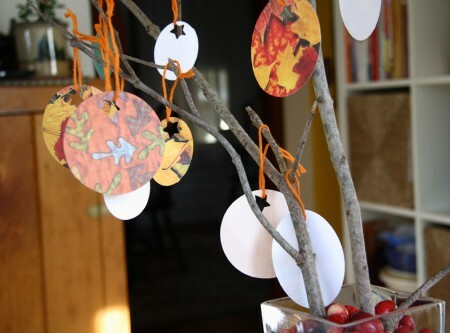 I strung those tags on orange yarn and hung them all on the branch and now each day we take off a blank tag and write something we are thankful for on it. So far it includes things like each other, our marriage, our jobs and our homes. We’ll continue to add to it each day until Thanksgiving and I’m sure we’ll come up with more creative and unique ideas as the days pass. It’s good to acknowledge all that we have. It’s good to be thankful. 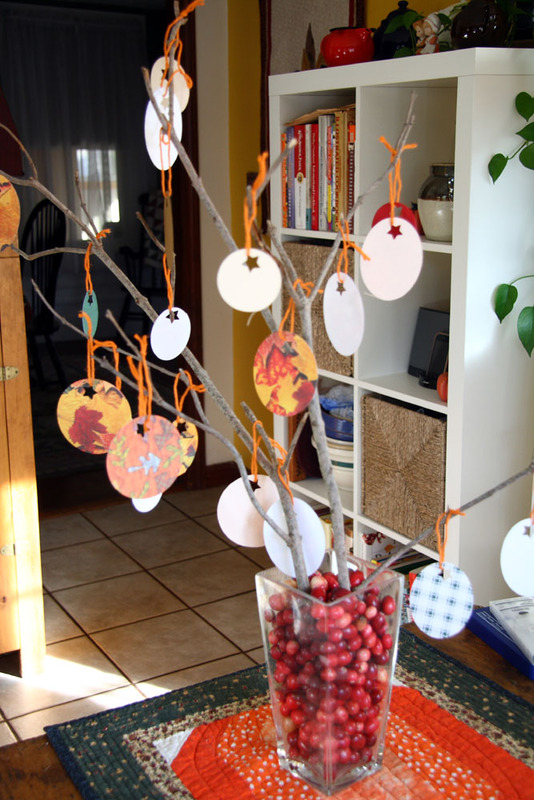 Just made a thankful tree with my preschool class – they are thankful for the sweetest things, some are priceless! I like the idea of using a branch next year. Yours is very cool. Love this idea! So easy to get swept up in the commercialization of our holiday seasons that it is nice to reflect on what is really important in life. I am putting together a thankful tree this weekend — so all of my Thanksgiving guests can participate (if they choose). Such a wonderful idea — and one of the reasons I’m such a Thanksgiving fan: food, family, friends, and a chance to think about all that we have. You are the craftiest!!! This is a great idea — I may put one together this week, although I’ll be thankful if I can find the supplies!!!! Such a sweet idea!! I LOVE the quilt!! Great idea and it’s so wonderful to see someone celebrating the beauty, the reason for Thanksgiving and not jumping to the next holiday. I love your tree and the quilt! I would love to do that! But I can hear it now…really? You want us to put our emotions…out there? 🙂 Have a great day! Wonderful idea! I’ve shared it with our kids and some friends, and will do one for next week – thanks. What an extremely good idea. But I’m crazy busy right now, so maybe I’ll wait a month and do this on our Christmas tree. One can still be thankful then, too, right? This is such a great idea! Thanks for posting it with time before Thanksgiving to make one for us. This is a wonderful idea. I definitely can see making one this weekend and leaving it up through Christmas. What a great way to show our gratitude for all our blessings! I think we are much happier when we live a thankful life, each day, and especially at this time of year. We all have much to be thankful for—and it’s good to be intentional about expressing it. Thanks for sharing this idea! I am thankful for my cyperfriend, Carole, who inspires me to be more creative and thoughtful each day. Thank you for the new Fid Family tradition! Everything in that picture (and in the sentiment) is beautiful, but can i just say that your quilted table runner steals the show? It’s gorgeous! How do I place my order? 🙂 Thanksgiving is my favorite holiday too!!! That is the best idea. I should try it but not this year – too crazy. I love this idea, and – with just a little bit of searching – I can produce all the needed supplies. (It will take a few minutes to sort through the scrapbooking papers to find the autumn themed pages!) The family’s Thanksgiving dinner is at my house this year, so I’m going to ask everyone to write something they are thankful for before dinner starts. Then perhaps we can read them as part of the blessing before the meal. I really like this idea. It’s good to have Thanksgiving acknowledged and not shoved aside in the rush to Christmas shopping. What a nice idea. It makes a great decoration too. What a beautiful and thoughtful idea. Looks great as a decoration, too. Great way to show thanks…this year I am especially thankful for my health and for the caring doctors and nurses who took care of me during my week in the hospital.